In other words, because employees are increasingly becoming free agents by balancing full-time work with freelance activity, Alboher’s blog offered advice and ideas for nine-to-fivers and entrepreneurs alike. Shifting Careers received positive reviews and a healthy amount of Web traffic, and as the unemployment rate has soared, you might have assumed that the blog would become an even more prominent Times feature. But you’d be wrong. Earlier this month, the paper informed Alboher, who wrote frequently about coping with layoffs, that she had been laid off, too. Two years ago, I was perplexed by the increasingly psychotic behavior of bargain hunters on the day after Thanksgiving. Sadly, my worst fears about Black Friday have been confirmed. Earlier today in Valley Stream, N.Y., a mob of 2,000 frenzied customers gave new meaning to the phrase “doorbuster sale” by forcing their way into a Wal-Mart shortly before its scheduled opening at 5 a.m. During the melee, one store employee near the entrance was trampled to death and four shoppers were injured. The stampede rushed past the fallen employee, even pushing police officers as they tried in vain to assist the victim. The commercialization of Christmas is an easy target, and it’s hardly a recent phenomenon. (Charlie Brown’s lament, “Isn’t there anyone who knows what Christmas is all about?”, first aired over 40 years ago.) But did you ever think a retail employee would lose his life simply because a bunch of selfish, desperate consumers were trying to save a measly $100 on a plasma TV? For at least a decade now, I’ve stayed at home on Black Friday. The chance to take advantage of a few early-bird sales doesn’t outweigh my aversion to circling jammed parking lots and navigating crowded aisles. And many people have apparently forgotten that we live in a wonderful age when you can purchase gifts online without leaving home. But given the tragedy that took place on Long Island this morning, I now believe that my annual self-imposed exile from the mall is actually helping me live to see Christmas morning. Saw your post on what happened at the Wal-Mart in Valley Stream, N.Y. Ironically, the median household income is north of $100,000 per year, which is more than double the national average ($48,000). Long story short, most of these people could have afforded to pay the extra $5 for Elmo at noon rather than 5 a.m.
Amen, brother. And I’m willing to bet that most of those 2,000 animals spent half the night waiting in line to buy things for themselves, not for other people. For the second time in four years, the Nittany Lions are Big Ten champions! Yesterday, Penn State was ranked No. 7 in the AP poll heading into their season finale against No. 17 Michigan State, a team that has always been unpredictable over the years. But with the Big Ten title and a trip to the Rose Bowl on the line, the Lions put on an offensive fireworks show, racking up 557 total yards on their way to a surprising 49–18 rout of the Spartans. With the victory, Penn State became just the sixth NCAA football team to reach 800 all-time wins, joining Michigan, Notre Dame, Texas, Nebraska, and Ohio State. And now, a brief history lesson. Because Penn State and Michigan State have identical origins as land-grant universities — in fact, they were founded within 10 days of each other in 1855 — the Big Ten decided to create a rivalry between the schools when PSU joined the conference in 1993. There are plenty of genuine, decades-old rivalries in the Big Ten, and every year, the winner of each rivalry game takes temporary possession of a quaint award, such as the Little Brown Jug (Michigan vs. Minnesota, since 1903) or the Old Oaken Bucket (Indiana vs. Purdue, since 1925). This collage of statues, shelves, and plaques was designed by former Michigan State coach George Perles, so at least my alma mater wasn’t responsible for creating such a monstrosity. Since the inception of the Land-Grant Trophy, I’ve read several opinions that it’s actually a failed project from a middle-school wood shop class, and it’s hard to argue with that assessment. 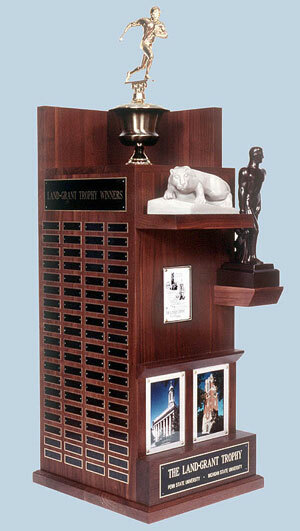 Thankfully, Penn State received another piece of hardware that’s much more meaningful: the Big Ten trophy. Congratulations to the Nittany Lions on their terrific season, and best of luck in the Rose Bowl! Generic store brands often crack me up, especially since many of them have names that don’t even try to avoid sounding like a cheap substitute. Until recently, my favorite has been the Genuardi’s answer to Kellogg’s Crispix cereal: Crispy Hexagons. Perhaps the product was targeted at kids who cram for their geometry test during breakfast. But even though the name is ridiculous, at least it’s so literal that you know exactly what’s inside the box. As of this evening, however, I think we have a new winner. Can you possibly guess which brand-name soda this product is trying to emulate? 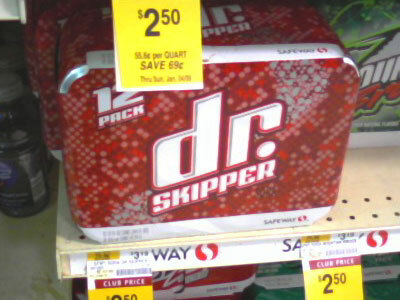 I used to drink lots of Diet Dr. Thunder from Super Wal-Mart when I lived in Las Vegas, NV. That Wikipedia entry makes reference to even more generic brands from other supermarket chains, including Dr. Bob (Tops Markets) and Dr. K (Kroger). But given the choice, if I ever need an alias, I’m totally going with Dr. Thunder. Yesterday, the Eagles took their 5–4 record (as well as their tenuous playoff hopes) to Cincinnati, where they faced the lowly 1–8 Bengals and came away with an ugly 13–13 tie, the first NFL game to end in a deadlock since 2002. You can’t blame Philly fans for their frustration over the Birds’ latest lackluster performance, especially against a struggling opponent. But there’s a much more troubling story at work here. Donovan McNabb, playing in his 10th season as the Eagles’ quarterback, was completely unaware of how overtime works in the NFL — that is, when a game is tied at the end of regulation and neither team scores during a single 15-minute overtime period, the game ends in a tie. Even worse, many of McNabb’s teammates were equally clueless about the rules, and coach Andy Reid defended their collective ignorance at a press conference earlier today. As a rather casual NFL fan, even I know that there’s only one overtime in pro football. How could I possibly be more knowledgeable than a veteran QB with a decade of experience? If I were an Eagles season-ticket holder, I would demand a refund for the remainder of the season, effective today. This morning, we were greeted by a grim headline: 516,000 new jobless claims were filed last week, and the total number of people collecting unemployment benefits reached 3,897,000 — the highest level since January 1983. How did the stock market respond to that news? The Dow Jones, Nasdaq, and S&P 500 indexes soared, each gaining more than 6.5% in value today. Quite simply, I just don’t get it. Two weeks ago tonight, the Phillies won the World Series, and now that all of the excitement has started to settle down, here are some parting thoughts on this huge achievement in Philadelphia sports history. The results. The Phillies posted a dominant 11–3 record during the playoffs, defeating the Milwaukee Brewers 3–1, the Los Angeles Dodgers 4–1, and the American League champion Tampa Bay Rays 4–1. Through the postseason, the Phils were 7–0 in their home games at Citizens Bank Park and became the first team since the 1999 Yankees to go undefeated at home through the playoffs. And it was only fitting that their star closer, Brad Lidge, closed out the final game of the World Series to finish his season with a perfect 48-for-48 record in save opportunities. What it means to the team. The Phillies’ 2008 triumph marked their first World Series championship in 28 years, and only their second title since the team’s establishment in 1883. What it means to the city. This was also the first major sports championship in Philadelphia in 25 years — the longest such drought of any four-team town. All of that frustration is finally gone. And I promise, you won’t hear me complain about Philadelphia sports teams for a long, long time. A single championship in this city is all I’ve asked for, and the Phillies delivered. Awful media coverage. I don’t play the “no respect” card very often, but very few sportswriters gave the Phillies much of a chance in the World Series. Seven of the 10 so-called experts’ picks from ESPN favored the Rays, and one of the analysts, Jim Caple, actually predicted a Tampa Bay sweep. Collectively, the analysts reasoned that the American League was far superior to the National League, that the Phillies would be rusty after a week off following their quick NLCS victory in five games, and that the Rays had a better pitching rotation. Thankfully, the Phillies proved all of those predictions wrong. Also, the commentators during the TV coverage on Fox, Joe Buck and Tim McCarver (a former Phillie! ), were blatantly obvious in their bias for the Rays. They excitedly talked about the Rays’ manager, Joe Maddon, at least five times as often as the Phillies’ skipper, Charlie Manuel, and only seemed to complain when the admittedly inconsistent officiating went against Tampa Bay. Sorry, guys, but your beloved team of underdogs didn’t win. And please make an effort to be more impartial in the future — there are two teams on the field. Other notes. When Game 5 of the World Series was suspended due to bad weather with a score of 2–2 after 5½ innings, I’ll admit that I started to worry that the bizarre, unprecedented postponement would somehow lead to an epic Phillies collapse. After all, Philadelphia sports fans have watched in horror as their teams lost to Mother Nature in the past. But thankfully, the Phillies pulled out the victory when the game resumed two nights later in the middle of the sixth inning. Here’s hoping we never again see a World Series game that takes nearly 50 hours to complete. And finally, I owe a huge apology to Charlie Manuel, the Phillies’ manager. I’ve openly questioned his steadfast optimism during his first season at the helm in 2005, and was thoroughly embarrassed by his fiery behavior during a post-game tirade in 2007. And this may sound a bit mean, but he never struck me as a particularly smart guy or strong leader. But I was completely, totally wrong about him — Charlie outcoached both Joe Torre and Joe Maddon in the final two rounds of the playoffs, and his decision-making in the last few innings of Game 5 was particularly brilliant. We’re all proud of you, Charlie, and know that you’ve earned a special place in the hearts of Philadelphia sports fans forever. At the present moment, I absolutely hate déjà vu. Nine years ago, on Nov. 6, 1999, Penn State was ranked No. 2 and held a 9–0 record. In a home game against Minnesota (5–3), the Nittany Lions settled for field goals for much of the game, allowed the Gophers to keep the score close, and gave up a game-winning field goal as time expired in a crushing 24–23 defeat. I saw that particular game in person, and will never forget the eerie silence of 96,000 stunned fans in Beaver Stadium after that game-ending kick — on homecoming weekend, no less. PSU’s hopes for a national title were dashed that year. Even worse, the Lions proceeded to lose their next two games as well, finishing their once-promising 1999 season with a dull thud. This weekend, Penn State took its No. 3 ranking and 9–0 record into its final road game of the season against Iowa (5–4). Once again, the Lions opted to kick field goals all afternoon, never managed to pull away from the Hawkeyes, surrendered a game-winning field goal with one second left, and lost by the exact same score, 24–23. Perhaps I’ve used up all of my sports-related luck with the Phillies’ improbable World Series title, and I know that college football teams tend to win national championships very, very infrequently. But this year’s PSU squad was arguably their best since 1994; talent like this simply doesn’t come around very often, which makes the loss to Iowa all the more frustrating. Well over 20 years have passed since the Nittany Lions won their last national championship, and I’m really starting to wonder if I’ll ever see them win another one in my lifetime. Last night, Barack Obama was elected the 44th president of the United States by a wide margin, and will become our first African-American commander-in-chief at his inauguration on Jan. 20. Politics aside, Obama’s victory represents a huge achievement in our nation’s history. Given the divisive nature of our country over the last several years, it’s not very surprising that Americans reacted to the election results in exactly two ways. Most Obama supporters were exuberant, practically expecting their candidate to solve all of America’s problems in short order. Meanwhile, the McCain faithful are deeply bitter and resentful, expressing paranoid fears that Obama will turn the U.S. into a socialist state and destroy the country. I’m reminded of my own post-election thoughts from four years ago: regardless of your political persuasion, the sun will rise again tomorrow. By definition, elections have winners and losers, and your candidate of choice doesn’t always come out on top. If you voted for Obama, don’t gloat; if you voted for McCain, don’t despair. Let’s make an effort to put aside our petty differences and give the new guy a chance, shall we?